IAC Ticketing Store | Purchase a Gift Certificate Today! Gift Certificates are the perfect gifts for any occasions! 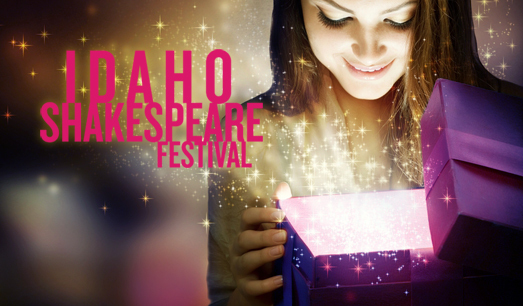 Birthdays, holidays, or just because, a gift certificate to the Idaho Shakespeare Festival always brings a smile to the recipient’s face! Gift Certificates can be redeemed for Season Tickets, Single Tickets or an ISF Membership. For a list of prices for Season and Single Tickets, please click HERE. PLEASE NOTE: Once your purchase has been completed, your certificate will be emailed to you within one to two business days. Purchasing for the holidays? If your certificate won't reach you in time for your holiday celebration, you'll have the option to print or save a Gift Certificate template at the end of your order, which you can fill out and present to your recipient! Once you receive your certificate, you'll just need to give them the code for their certificate. Please select the season you would like the gift certificate to be valid for. Please Note that gift certificates must be redeemed in the season they are purchased for. If you would like the certificate to be addressed to the recipient, please enter how you would like the name to appear here. If you would like the certificate to list who it's from, please enter how you would like the name to appear here. If you would like the certificate to have an additional message, please add it here. If you have any additional information to include, please enter it here. Thank you purchasing a Gift Certificate!